Not only are Abel Sports coach’s boxes and interchange benches appearing on many suburban sports grounds throughout Australia, they are now being adapted for some major venues. 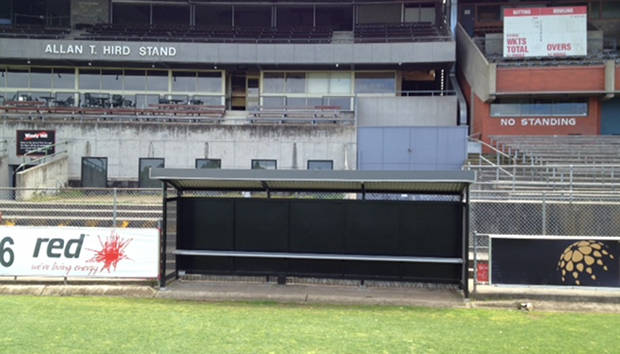 Recently Abel was requested to remove the old interchange benches at Windy Hill, Essendon Football Clubs old ground and install new custom made interchange benches to replace these old ones. This was done fairly easily without upsetting any training sessions [particularly coaches] or damaging the Oval. 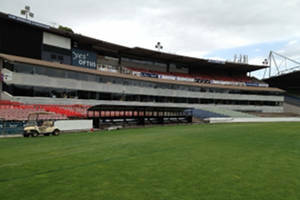 Another request to do a similar project at Visy Park, Carlton Football Clubs home ground was not as easy. Carlton required Abel to install two interchange benches that each could accommodate up to 23 people and also an official bench that could accommodate 12 officials. Once again Abel customized these benches to fit into the area from which the old ones were removed. 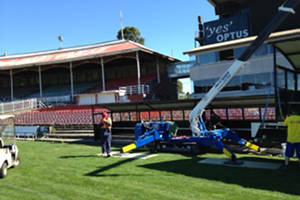 This task became more difficult to maneuverer between Carlton team training sessions and the concern with Cranes damaging the oval surface. To solve this problem a Spider Crawler Crane was used that moves on caterpillar tracks. Another successful project for Abel Sports , happy groundsman , happy coach?